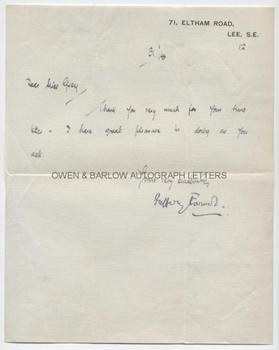 JEFFREY FARNOL autograph letter Signed. ALS. 1p. 71 Eltham Road, Lee, SE. 31st January 1918. To Miss [Evelyn] Grey. 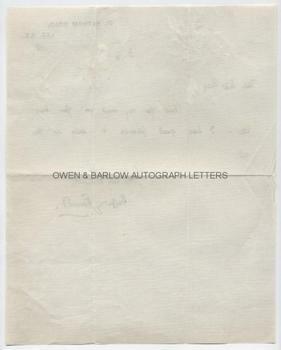 A short note to an autograph collector. "Thank you very much for your kind letter. I have great pleasure in doing as you ask." Signed with an nice example of his signature. 4to. Approx 10 x 8 inches. Very slight mounting traces to verso, else fine. John Jeffrey Farnol was a prolific author of romantic and swashbuckling novels set in the Regency period. With Georgette Heyer, he can be credited with the invention of the Regency romance genre of fiction. From the album of Miss Evelyn Grey, a young lady who began collecting autographs to pass the time whilst convalescing in hospital during WW1. She seems to have had a particular penchant for novelists as many of the autographs in her album were of popular authors of the day.